Most Americans think of musical pitches as being “high” or “low.” But this height metaphor isn’t universal — some cultures use “thin” and “thick” or “light” and “heavy” to describe musical pitches. New research published in Psychological Science suggests that the metaphors we use aren’t just linguistic flourishes — visual cues have different effects on our perception of musical pitch depending on the metaphors we use. Daniel Casasanto of the New School for Social Research in collaboration with Sarah Dolscheid and colleagues at the Max Planck Institute for Psycholinguistics presented Dutch- and Farsi-speaking people — who use different musical pitch metaphors — with musical tones of different pitches. The tones were accompanied by images on a computer screen: horizontal lines that varied in how high or low they were placed on the screen, or vertical lines in the middle of the screen that varied in thickness. After each trial, the participants were asked to sing the tone they heard. The researchers found that visual stimuli that matched the participants’ linguistic metaphors changed their perception of pitch, but had no effect for participants who used a different metaphor. Dutch participants, who use “high” and “low” to describe pitch, were affected by the lines at placed at different heights. When the line was towards the top of the screen, they sang the pitch slightly sharp; when the line was towards the bottom of the screen, they sang the pitch slightly flat. Farsi speakers, who talk about pitch in terms of “thin” and “thick,” were affected by the relative thickness of the lines. Thicker lines made them sing slightly more flat, and thinner lines made them to sing slightly more sharp. The researchers found that the association between the metaphors and musical pitches holds even if the participants are prevented from using the words themselves. Dutch participants could be trained to use the Farsi metaphor, and they produced pitches as if they had been using the thick/thin metaphor all their lives. But, in an intriguing twist, the researchers found that the metaphor couldn’t be reversed. Dutch participants who were taught to associate high-pitched sounds with “thick” and low-pitched sounds with “thin” were unaffected by thick and thin lines presented on the screen. The researchers conclude that the low = thick and high = thin associations might be innate in humans, or could be learned from physical experiences very early in life: Another study revealed that even before children can talk they respond to associations between pitch and height and between pitch and thickness. 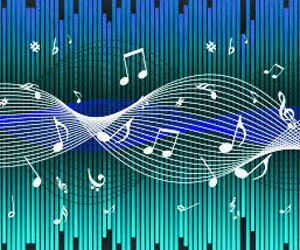 These findings indicate that people who use different metaphors for musical pitch think about pitch differently, even when they’re not using language — yet there may be underlying associations between space and musical pitch that we all share.